An engine that runs too hot does not last long. While your engine’s cooling system is responsible for regulating operating temperature, your exhaust system also plays a major role. Much of the heat energy of the combustion process is unusable and must be disposed of quickly. That is the job of all the piping and ducting that runs from the motor to the back bumper. Hot air and vapors are cleaned, cooled, and passed safely out of the rear pipe. Old worn out pipes with leaks and restrictions need to be replaced. We specialize in muffler repairs and can install custom exhaust systems that will hwlp keep your engine running at its best. Contact our Meineke #197 in Virginia Beach, VA, for an evaluation. A question we are frequently asked at Meineke #197 in Virginia Beach, VA, is: "When do custom exhaust systems need inspections?" If you're already asking this question, you probably need one. You might be noticing odd symptoms such as louder volume, stronger fumes, or a new vibration. These are all signs of leaks and failing catalytic converters. Even if you're not noticing any of these symptoms, your car's performance exhaust system should be inspected if it's over 8 years old. Ensure that your car is in the greatest shape it can be in. 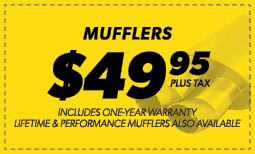 Investing in muffler repairs will increase your car's longevity before the problems get any worse. A common question we receive at Meineke #197 in Virginia Beach, VA, is whether fuel efficiency is really affected by the exhaust system. The answer is yes. Your exhaust system should include an oxygen sensor. This sensor is designed to detect the amount of oxygen that is coming through the entire exhaust system. It sends a signal to your engine to either increase or decrease the amount of fuel it burns to maintain maximum efficiency. However, if the oxygen sensor is defective, it can cause your vehicle to expend unnecessary fuel. Having your oxygen sensor changed every 60,000 miles can help eliminate this issue before it begins. Exhaust systems do eventually wear out. The combustion process inside of your engine creates a tremendous amount of heat. This forces chemical changes to occur. While much of your fuel is burned up, one of the remaining byproducts is water vapor. This vapor comes into contact with the metals causing oxidation and rust. Eventually the metals of your manifold, pipes, and car muffler wear out. They develop cracks and weak spots. You may hear loud engine noises or notice an odor as you drive. Fixing the problem may require an aftermarket exhaust or even a custom exhaust system to be installed. If you are experiencing any of these warning signs, contact our in Virginia Beach VA, and have your vehicle inspected. Unless you are a trained mechanic, you may miss warning signs of serious problems with your vehicle. Save money the smart way by stopping by our online exhaust repair coupon site. Not only will your inspection and repairs be made by a professional mechanic at Meineke #197 in Virginia Beach, VA, you may save yourself valuable time and money in preventing future issues with your muffler or exhaust system.